A gorgeous and deeply intimate memoir about families breaking apart When Jane Alison was a child, her family met another that seemed like its mirror: a father in the Foreign Service, a beautiful mother, and two little girls, the younger two (one of them Jane) sharing a birthday. The families became inseparable almost instantly. Within months, however, affairs ignited between the adults, and before long the parents exchanged partners, then divorced, remarried, and moved on. Two pairs of girls were left in shock, a “silent, numb shock, like a crack inside stone, not enough to split it but inside, silently fissuring” that would prove tragic. To put this in context, neither non-fiction generally, nor memoir specifically, are among my favourite genres. But this book is so well-crafted, so compelling, I was drawn in from the start. Alison describes the trauma of her childhood, caused by her parents switching marriages with another couple, combined with both families travelling for diplomatic purposes, with incredible clarity and emotional truth. She goes on to discuss the fall-out for herself and one of her step-sisters – both developed substance abuse problems – and the later relationships with her parents and step-parents. At several points in the book, she questions whether her parents should have dealt with the situation differently, and what it might have meant to her life had they done so. Every time the question arises, she asserts that she is, ultimately, glad it was done the way it was done. I’m not sure I believe her. And yet, the honesty – both the emotional honesty, and her attempt to tell the true story (and her acknowledgement that she does not know the whole story, and can only tell the truth from her own perspective) – is, again, compelling. That this was combined with the excellent writing meant I was drawn in, utterly reluctant to put the book down. In addition, I had clear pictures of most scenes. Alison is also an artist and illustrator, and I suspect this is behind her ability to create such vivid images in her writing. 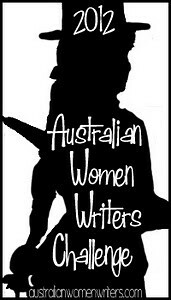 This is an extra review for the 2012 Australian Women Writers Challenge. You can see my full list of books here. You can find a full list of my reviews, and other posts relevant to the challenge, here. Jo, what a fascinating story it seems to be. I loved your last recommendation to me, so I’ll have to chase this one down too. Glad to hear you enjoyed the last one – the Alice Pung? That reminds me, I want to pick up her second one. If you want, I can bring my copy of The Sisters Antipodes to the next Hoyden meet-up to give to you (that is not some kind of unsubtle hint, btw!). Jo, it was the Audrey Niffenegger. @tt: oh yes, of course. Thinking too literally about “last”! Probably my plus one and I will be free, too. Mimbles on twitter just pointed out that 2 September is Fathers Day, so that might change things a bit. You’re right, so it is. I will definitely be otherwise engaged. Sorry, hoydens. Yes, I will need to be doing family things, too. But there’s a chance I could be free for lunch/in the early arvo.